However, the odds of not leaving on that date were increased due to a series of votes in the UK House of Commons in recent days, and subsequent to those events, Theresa May seems to be backing-off from her usual assertions that “the UK will indeed Leave the European Union on March 29, 2019,” which is having the effect of causing even more uncertainty in the UK economy than had been the case over the previous 999-days. BUT IF THE OFFICIAL BREXIT DATE IS MISSED DUE TO A FAULT OF THE UK GOVERNMENT, THEREBY RESULTING IN A FAILURE TO DELIVER BREXIT ON TIME AND AS PROMISED; Beginning March 29, 2019 the UK government could be sued by UK businesses for losses resulting from an oft-promised and subsequently missed official Brexit date — especially when no advance warning was given to UK businesses about a potential missed Brexit prior to the end of the 4th-quarter reporting period. March 15, 2019 06:26 / 1 Comment on MP’s Back Brexit Delay: A Vote for Mediocrity! London, March 14, 2019: British MP’s vote on a number of indicative votes in the House of Commons to help the government gain some understanding of where Parliament sits on each potential pathway forward through the final days of the Brexit process. At least, that’s what we were led to believe. What actually happened was that Theresa May loaded a Trojan Horse into the day’s festivities and thereby received permission from Parliamentarians for an Article 50 extension. Which was her only goal methinks, the rest of it was for show. One good thing that came about in the voting was the complete lack of enthusiasm for a so-called ‘People’s Vote’ (a 2nd referendum on leaving the EU) which was soundly defeated 334 votes to 85 — a margin of 249 votes. 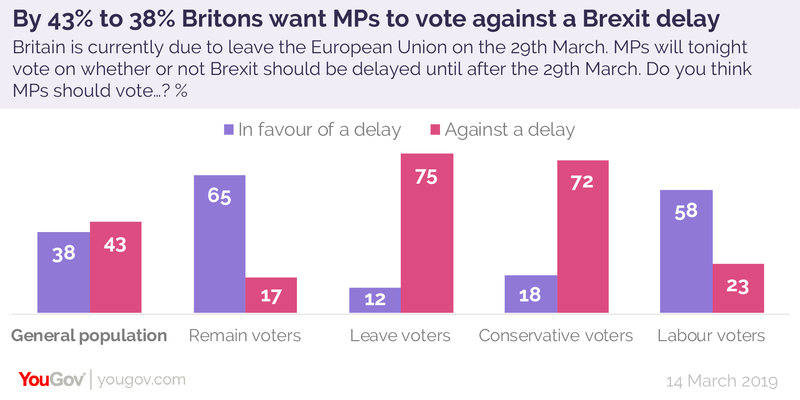 But not everything went well as MP’s backed the government’s motion (413 votes to 202) to extend Article 50 beyond the promised March 29, 2019 deadline. It’s the worst thing Parliament has done since Prime Minister Neville Chamberlain (1937-1940) decided to appease, rather than confront, the mounting threat in Europe. Which (policy) didn’t end well. Nor will this end well, a vote that rewards Prime Minister Theresa May’s lack of accomplishment towards a viable Withdrawal Agreement (which UK voters didn’t vote for on the referendum ballot) but which Theresa May tells us is of the utmost importance (it isn’t) and which has worked to lower peoples’ perceptions of the quality of government and timeliness of government they receive from their elected officials. I fully expect at the next General Election there will be a thorough housecleaning as voters won’t forget what they were promised ad nauseam since July 2016, and what The Government writ large has massively failed to deliver. Rewarding Theresa May and her government for failing to deliver on every promise made about Brexit over the past 3-years by giving her even more time to fail is outrageous. MP’s should hang their heads in shame and walk humbly among The People wearing only sackcloth and ashes for the next 10-years to atone for their inability to hold the Prime Minister to account and for lowering the threshold of good government, generally. A well-known truism states that “Every day, we teach others how to treat us,” and members of the House of Commons have just taught Theresa May that incompetence, false promises, and weak government, will be rewarded with more time to accomplish more of the same (which, on the Brexit file, is piss-all thus far) and it’s shameful what MP’s have done. No government in history has accomplished less in 994-days on their main policy platform than the Theresa May government. Let me be clear! If Brexit doesn’t occur on March 29, 2019 as promised by the government Theresa May should be fired for non-performance. If you can’t get the job done in 1009-days (June 23, 2016 – March 29, 2019) then you don’t deserve the job! Is that really so hard for the snowflake generation to understand? It should be noted that the EU is under no obligation to extend the Article 50 deadline and that many senior EU and EC officials have said that the UK government would need to provide a good reason to extend the deadline. Apparently, the EU won’t simply extend the deadline just because British politicians ask for it. Which seems completely appropriate and I will support the EU if it won’t agree to an Article 50 extension. There’s already been too much economic uncertainty, and for too long. Theresa the Remainer has said all the right things since she accepted the job of UK Prime Minister in July 2016, yet here we are 994-days later, and now she wants an extension to get the job done that she should’ve accomplished within months of the EU referendum vote. Micheal Gove could’ve gotten the job done in 1-year although he might have ruffled a few feathers in Brussels. Jacob Rees-Mogg, for another example, could’ve gotten the job done in 2-years and it would’ve been a very gentlemanly Brexit indeed, however, he wouldn’t have understood the Eurocrat mindset which might’ve caused him consternation. And Boris Johnson would’ve made a titanic success of Brexit but may have caused hard feelings between the UK and EU governments. Still, the job of Brexit would’ve been done and dusted long ago, minus gazillions of tons of uncertainty over the past 994-days were any of those three in the PM’s chair since July 2016. Theresa May certainly isn’t indispensable as regards Brexit. As Theresa May herself has said many times, “Brexit delayed is Brexit denied,” and sending an Article 50 extension request to the EU now would kick the Brexit can down the road. Significantly. As I said at the outset, Theresa May loaded a Trojan Horse into today’s House of Commons proceedings and in the excitement not one person recognized how profoundly she’s changed the Brexit story. Now she imagines she has a job for life — and for the next 12-months she’ll only fan the flames of Brexit whenever she needs support to stay in power. Eventually, she knows that Brexit will die of overexposure in the public domain. But not to worry, she’ll have found something else by then to keep her in power, thanks to those MP’s who choose to reward mediocre Prime Ministers. Theresa the Remainer was right! Brexit delayed, is indeed, Brexit denied. I’m beginning to think that Theresa the Remainer decided long ago that the best way to keep her job for the longest amount of time and to stop Brexit was to delay Brexit for as long as possible. And her enablers are those MP’s who reward Prime Ministers who can’t (or don’t want to) succeed at their primary (and oft-stated) goal. But it’s likely you aren’t interested in what Britons think if you’re one of the 413 UK politicians who voted for an Article 50 extension in today’s House of Commons vote, but some 43% of Britons don’t want any further Brexit delay, they just want it over and done so as to end the present period of economic uncertainty — while 38% of Britons want to delay Brexit in hopes that Brexit will simply fade away.